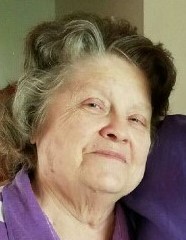 Age 79, of Nicholasville, KY, formerly of Ashland, went to be with the Lord April 16, 2019. She was born January 11, 1940 in Jasmine County, KY to Charles and Emma (Stennett) Morefield. She was a homemaker and in her younger days enjoyed cross-stitching, crocheting, and was of the Pentecostal faith. She is survived by her husband of 37 years, Bill Grashel; three sons, Jackie Steele, Jr. and special friend Debbie Braun of Raceland, KY, Bradley Steele of Nicholasville, KY, Jerry Steele of San Diego, CA; stepchildren, Anita (Ray) Derifield of Pedro, Patricia (Don) Scaff of Wheelersburg, Randall (Angie) Grashel of Wheelersburg; nine grandchildren; many great-grandchildren; daughter-in-law, Rhonda Steele. In addition to her parents, she was preceded in death by three sisters, Loretta Hunt, Mary Steele, Gail Brumfield; one brother in infancy. Funeral services will be 1:00 p.m. Tuesday, April 23, 2019 at D.W. SWICK-NELSON FUNERAL HOME in Wheelersburg with Bill Grashel officiating. Interment will follow at South Webster Cemetery. Friends may call on Monday from 5 – 7 p.m. and one hour prior to the service on Tuesday. Fond memories of Patricia and expressions of condolence may be shared at www.DWSwickNelsonFuneralHome.com.